As a fan, retired player, or a member of the media, whatever you think you know about how the Colts offense works is probably mostly incomplete. This excludes some players or coaches who have regularly played against the Colts. Clyde Christensen calls in "concepts / ideas" based on the personnel grouping as well as the gameplan developed in concert with Manning and Tom Moore during the practice week. Generally the personnel grouping (either 2 WRs & 2 TEs, or 3 WRs & 1 TE) at the start of the drive will be chosen based on consensus between Manning, Moore, and Christensen. Sometimes different groupings will be sent in by Christensen during the course of a drive. Occasionally Manning disagrees with the choices made for subs and will wave incoming players back to the sidelines. The Colts will come to the line with 20 or more seconds on the play clock. Sometimes a play has already been signaled, sometimes not. Manning then looks at the defensive formation and uses his encyclopedic knowledge of the defensive coordinator's previous games (going back three seasons or more, even if the defensive coach was with a different team or even serving as an assistant to another coach). If he is still not sure at that point what the defense is doing he will simulate the beginning of a the play to coax the defense into showing what their intentions are. Manning is looking for the reaction by the defensive players to the snap of the ball they thought was about to occur. This is usually in the form of a false step or lean that a player will display when they are intent on reacting to the snap and getting to their assignment as quickly as possible. The more things the opposing defense is trying to do, the more likely they will give things away. Whether or not a LB is rushing the passer or in coverage. If the LB is in coverage, sometimes how he moves during this moment can give away whether he is in a zone or covering a particular man. A move towards a player (as well as his eyes focusing on a particular player) gives away his assignment. If the player seems to be ready to move in a particular arbitrary direction (particularly backwards) then he will show that he has a zone assignment as well as giving away what part of the field is his responsibility. Safeties can be induced to show whether they are in a cover two (two safeties back, each with a deep half of the field to cover), cover one (one safety in the deep middle, the other closer to the line in man coverage / run support), cover three (one safety in the deep middle, the other in a short middle zone. Cornerbacks would cover the deep sideline). If both safeties are close to the line or moving that way then you can assume they are either blitzing or in man - with others blitzing. I don't see him look at the corners much, I think what the safeties are doing tells him what the corners are doing. From all that he has a pretty good idea what is coming. At this point he signals the WRs and TEs their assignments, then the RB. Next he tells the OL who is rushing and who isn't; giving them their blocking assignments. Then he tells the RB who to block (in a way that is indistinguishable from the instructions he would give for a running play). At this point if Manning is still not sure who is rushing (as when the defense is trying to give Manning false clues), he will signal the players to have yet another false start of the play. He will then give final blocking assignments based on anything that the defense gives away. Of particular importance is whether the defensive players have the same reaction to what they thought was the impending snap of the ball. At the snap of the ball Manning has a particular defender he is keying on for confirmation that his pre-snap assessment was correct. The WRs often have more than one route they can run, based on their reading of the coverage just after the snap of the ball. It is hoped that they reach the right conclusions and end up where Manning expects them to be. Probably 80% of Manning interceptions are due to the receiver running his route incorrectly. Note: Sometimes this is a route that is completely the wrong choice, sometimes it is a subtle error in angle or timing that causes a ball to seem inaccurate or misplaced. The tip off is to watch Manning's feedback to the guy who made the mistake that caused the play to fail. On a incorrectly performed route, Manning will make arm motions showing how he should have run the route. If the player simply ran the wrong route, Manning will go up to him and ask what they were thinking and then correct them as is necessary. Just after the real snap, he will key on a particular defensive player, usually a safety. Generally he has designed a play at the LOS that will stress a particular player or area of the field. He is looking for instant confirmation of what he had deduced pre-snap. 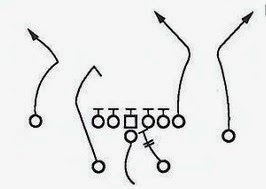 Once he sees this, the rest is just dependent of the performance of the receiver in getting open. Sometimes if the play design forces a safety to choose who to help on (usually high or low), Manning will be ready to throw the ball instantly based on that safety's actions. If the safety decides to help on the shorter route (or is indecisive) Manning will go to the deeper player. I can guarantee you that this is extremely close to what happens on most plays. The reason teams struggle (and fail) to disguise their defenses against Manning is that they cannot conceive (based on their own playing experience) how much he is processing. The normal process is that players run what is called and coaches will take what they see happening and will make any minor adjustments after the defense comes off the field. Occasionally larger changes are made at halftime. The design of modern defenses don't even factor in the need to counter a series of offensive plays completely designed at the line of scrimmage; from the routes the receivers run, the depth of the QBs drop, and the actual blocking scheme employed. This is because even as the Colts have been running this system for about eight years now, nobody else have really done more than imitate small parts of it. It is not a matter of choice. What the Colts do violates the very structure that is in place at every professional, college, and high school - since the beginning of football. The only thing harder to find than a offensive coach willing to cede most of his authority to a single player - is finding a player who has the faculties, drive, and leadership ability to completely take advantage of the opportunity. What Manning does 45 times a game every Sunday would have been thought to be impossible by the leading minds in the game as recently as 2004. Yes, there is overlap there. The Colts were doing most of this since 2002, but it probably was not until 2004 that the most brilliant guys in the league understood and believed that what they were seeing was more than a QB changing from one set play to another (like what Jim Kelly was doing in Buffalo). Most of the time nowadays when you hear the commentators mention during a game that the QB is changing the play, they will either infer or plainly state that they are doing it like Manning. This is simply not the case. Perhaps certain teams give the QB more latitude to make changes to the line, but most of the time it is still a matter of changing from one set play to another, or maybe a simple change to a route (go long!). The 2010 season is the first time that the guys announcing the games seem to have an idea about how much Manning is doing. It took them six or seven years to catch on and to believe what they were being told by current and recently retired players. That is why you no longer hear them spew the complete BS about Moore calling in three plays and that Manning picks one. Or that most of Manning's signals are phony. The three plays crap went out the window after 2003. And *every* signal Manning gives means *something*. I think that Belichick was the first to really get what was going on. It would take someone like him to figure this out since he probably is one of the few guys around who is far enough ahead of his time in his own area of expertise that it was easier for him to believe that it would be possible to do what Manning does. Note: Belichick's main innovation (in my opinion) is the idea of changing the basic underlying scheme of his defense to match and attack the design of the opposing offense. He gets experienced and intelligent players who can, on a weekly basis, learn different defensive schemes and then translate that understanding to execution. Before Belichick, this was not something that would have been considered possible by the leading minds in the game. Anyways, so what can be done about it? Judging by Manning's success, no one really has the complete answer. You want to know the best way to beat the Colts? Play coverage the whole game with particular attention to seam and post routes. Make Manning throw 15 seven yards passes to get to the red zone. Just hope you get a pick from a tipped pass or poor route. Do NOT blitz him - that is death. You will only get to Manning if he has to eat the ball because a receiver fell down or ran the wrong route adjustment. Play nickel even if the Colts are in 2 TE, but do not play both safeties deep in coverage. Play variations of tight man with deep safety help or cover three. If Manning sees you *both* playing nickel *and* playing the safeties deep he *will* audible to the exact running play that hurt you the most. Playing conservative nickel against the Colt's 2 TE formation will cause you to give up more running yards that you would like, but it is better than the alternative. Always remember that while Manning is there, whoever starts at TE will be someone you have to treat as a top level slot WR. You just will have to be conservative and hope your players win some individual matchups. If you do this; you have a chance to make them kick a few field goals that otherwise would have been touchdowns. Then you HAVE to score a lot. Because the Colts will. There was a time when the better 3-4 coordinators were able to blitz the Manning effectively, but this does not happen anymore. This happened with all of the Colts losses to Pittsburgh and San Diego in the playoffs. These two teams were able to design blitzes that attacked the Colts archaic offensive line scheme, causing a defender or two to have a free run at Manning without outnumbering the blockers. This even happened at times when they were blitzing only one LB (four rushers total) and the Colts had five blocking with a RB check. The scheme was archaic and not dynamic enough. This is not a total slam on Howard Mudd, the celebrated OL coach of this period. The players were well-coached in their scheme - but the scheme could be defeated by complex 3-4 blitz design. This problem was made worse by Manning stubborn insistence on continuing to throw deep passes in order to attack the blitz. This usually worked in the regular season, but in the playoffs it failed due to the more complex and well-executed schemes they would see. This even happened when facing teams that they had either beaten or scored well against in the regular season. Former New England players have revealed that Belichick had a simpler "regular season" Colts scheme as well as a "playoff" scheme. The better playoff bound teams generally know who their real competition is in the playoffs; it would be foolish to think that they only start preparing for a team after they find out who they are playing. In response to failure of the line scheme against 3-4 blitzing defenses, Manning started directly making the offensive line calls for both passing and running plays. He took these duties over from the center Jeff Saturday. In the past it was not uncommon for QBs to point out probable blitzers to the offensive lineman making the line calls, but it is unprecedented for a QB to be directly making the calls and adjustments for the line for nearly every play. The radical nature of what the Colts do (as well as the level of responsibility and involvement on Manning), caused a telling remark by former Super Bowl MVP Quarterback Phil Simms during a 2007 telecast he was doing of a Colts game. He was asked by his broadcast partner Jim Nance to describe how good Manning was, Simms replied that "Manning plays a position that I am unfamiliar with". This is a stunning comment from a guy who was extremely successful as a cerebral QB and retired only 14 years prior. ". . . a position that I am unfamiliar with" means that the nature of what Manning does as a QB is so different than what Phil Simms experienced in the NFL that there is no comparison possible. Sometime defenses come into the game expecting to rattle Manning by blitzing him and hitting or sacking him. This simply has no affect on Manning whatsoever. He has missed one play due to being hit in his entire career. That was on a 2nd down play that ending with him suffering a broken jaw. He was back in the game the very next series and played with his jaw wired shut for the next several weeks. Any fan or commentator who seriously questions Manning's toughness is a complete idiot. It *is* possible to rattle Manning though, owing to the one fault he has: he takes complete responsibility unto himself for winning each game. Because of this, Manning will occasionally be rattled by a team getting a big lead in such a way that makes it look as though you will keep scoring at will. By this I mean to earn touchdowns through a concerted effort against the Colts defense, making it seem as if you will continue to score. If you can make Manning feel as though he has to score points on every drive, and you have the ability to play complex coverages behind an effective three or four man rush, and it is a elimination game - you might see Manning get rattled and start forcing the ball downfield. But that is a lot of ifs & ands. Examples of this has happened would be each playoff loss to New England and the Super Bowl loss to the New Orleans Saints. I have never seen Manning as rattled and out of sync as he was during the entire fourth quarter against the Saints in the Super Bowl. The game clinching interception happened because Manning forced a ball into Wayne on that slant when it wasn't there. Wayne was so used to Manning immediately seeing when the play was not there and throwing the ball somewhere else that he stopped on the route, causing an easy interception. Yes the defender got a good jump on the ball, but the Colts run that route combination all the time without getting it picked - because he had always been able to see it was covered and just throw the ball somewhere else. That defender driving on that route leaves a gaping hole behind him, opening the door to the crossing route coming from the other side. Another strategy I thought of a while back was to have your defense line up in the exact formation each play with no variation at all. No moving, no looking around, no slow creeping. Nothing. Don't move a muscle until you see the ball actually move. Just a blank slate that cannot be "read". Sure you would be out of position a few times; but is that really worse that what is going to happen to you otherwise? By doing this you would rob Manning of the main advantage he has over everyone else - determining your intentions based on tendencies and body language. The more you do to fool Manning, the more data you give him to reveal what is coming. Please take a look . . .
Hey there, great article. It was a fantastic read! I also think that the bit about the defenders hiding what they are doing is already being done, or at least they attempt to do it. It's just that defenders can't just sit there, they aren't trained to do it. When Peyton fake snaps the ball, they will do SOMETHING, it's just human nature to react, especially when the adrenaline is pumping. Some teams have hidden it better than others, but in general this is a difficult task. >> points with 4 minutes left in a game, where he stays completely calm. What kicks did Vanderjact miss when the games was on the line? Was it the 50 yard ones that no one would blame him for missing? Or was it the one he *should* have made that he missed? That is where the real pressure is, performing well when you are expected to. When Vanderjact made those 50 yd FGs on the road in Denver, in the snow, and cold - no one whould have said boo had he missed. The ones he should have made are the one he choked on. There is NO pressure on the players when you are down 17. Now the coaches, that is another story. >> It's just that defenders can't just sit there, they aren't trained to do it. The problem is that they are coached to hide what they are doing. Even when they are trying to hide they are telling Manning *something* that he can remember later and screw you with it. The trick is just what I said - don't coach the defense to be sneaky - tell them if they move a single muscle before that ball moves - they are going to be sitting for a while. In baseball there was a school of thought as to how to pitch hitting great Tony Gwynn. He would take the ball where ever you pitched it. So people started throwing right down the middle because he would hesitate as to where to try to pull it or go the other way. If someone is kicking your head in year after year, you have to get a little creative. I agree, trying to outsmart Manning will backfire on most plays in most schemes. Taking Manning's brain out of the game is sometimes worth the extra time it would take the defenders to react to a play when their stance is not set. However, Manning and company seem to have a perfect answer for this already. Washington tried this trick, which has been referred to as the "Times Square Defense." So the Colts ran the "blur," or "stampede," which means Manning came to the line of scrimmage with the play already set and was able to act very quickly on the line, catching the touristy defenders off-guard. My favorite thing about the Colt's QB is how he continues to improve. It's not like he and Tom Moore developed an offense his first few years, and now they just run it. Every season, every game, Peyton is evoling to the next level. The man is a freak. >> What kicks did Vanderjact miss when the games was on the line? There were at least two during the regular season in important games that I cannot be bothered to look up right now. Simms is not in the Hall of Fame. You are right and I have no idea why I thought he was. This is the best sports article I've read since I've known how to read. Do not blitz him this is death??? that is the only way you can beat manning is to pressure him and put him on his back. if you give him more than 3 seconds he will eat your lunch i don't care how good your secondary is. Somebody gonna try and hire you as a DC. Against Manning I don't think its just the defense job to stop him. I truly believe its the offense job as well. The Colts D has been set up after Mannings abilities. They are small and fast and thus meant to play with a lead to just tee off the quarterback. I think the theory of having to score lots of points is wrong(per se). Running the ball is the key. Give Manning as little time as possible and you have more of a chance of getting him frustrated and try to score on every play. Now obviously you do have to score because there is no way the Colts are going to get shut out. I cant even remember when was the last time they did get shut out. However if your team is a passing sissy team then obviously you have to outscore them. If you are a power team I think you have better chance. great article..always wondered what the heck he was doing at the line of scrimmage. He simply defies a lot of defensive schemes with his brain power...amazing. I guess that's why I've had him as my fantasty quarterback for years. Thanks for the great article. >> This is the best sports article I've read since I've known how to read. Historically teams that have tried this get bashed. There have been exceptions. >> Somebody gonna try and hire you as a DC. I understand that teams try to reveal as little as possible to just win that weeks games so they could have something to save for the playoffs, but could you give an example of a common difference between a belichick 'regular season' scheme versus a 'playoff' scheme? I remember in the 2003 AFC Champioship gm, that belichick had safties playing corner and corners playing safety effectively confusing the heck outta Manning. Was that all it was? And two does plays such as the infamous 4th and 2 attempted by the Pats last season a confirmation that Belichick has been figured out by Mannig and he really has nothing else to throw at him to stop him consistently? I don't believe that the 4th and 2 play call had anything to do with Belichick having any disbelief in his defense. I think it was based on the observation that at NO time in the game up to that point did the Colt's D show any ability whatsoever to stop a two yard run. He was calling a play that had a 99% previous success rate. well, the Pats figured it out! All this genius and Brady wins again! (8-4 lifetime)against Ali Peyton because he threw another errant pass (apparently not is his capability) in the clutch at the end of the game. This makes 3-times in the last 11 games when the master should of won! hmmm maybe great, but not a clutch player. Ah... I was wondering when the Patriots fans would chime in. Welcome, thanks for dropping by. Great article. Could you perhaps elaborate on how the Patriots made a "great plan" and managed to fool Manning? Thank you very much! I think the Pats and the Colts will probably be meeting again this year! ...yeah, lets keep the homerism to a minimum, shall we? No one else in this league has had the unbroken string of success on offense that the Colts have had since 1999. That is eleven years of continuous offensive success. If it is so easy, why isn't anyone else doing it? Because they don't want to? Why? All it takes is one team to win the super bowl with a 3-4 defense and a few years later half the league is running the 3-4. This league is and has always been about copying the success of others. So until you can tell me why not even a single team has not been doing what the Colts do - even for a single season - it is not homer-ism. It is just reality. You don't have to do what Manning does to win football games. Four teams NOT doing what Peyton does have already beaten the Colts this year. This has nothing to do with what I just said. I guess you know when you are losing an argument so you act like we were talking about something else? Kind of lame. I was hoping for an actual debate, I think you are a bit outmatched. Thanks for coming by though. You are welcome any time. I wrote about the Super Bowl victories, but I am a different "Anonymous" poster than the other guy. So this is actually a different thread. The Super Bowls have everything to do with what you said. You said that the Colts have had "eleven years of continuous offensive success." My point is that No, they haven't. They lost some games in there. And by any measure they only won 1 out of 11 Super Bowls. Peyton is 9-9 in playoffs. Peyton Manning is a great quartback and staple of the Colts. BUt you speak of him like the Colts offense is the greatest thing ever, he is the only one that can do it, therefore he is the greatest ever, and by extension the Colts are the greatest ever. Well if you define "Best Team Ever" as "Having a quarterback with great passing stats" then you might be right. But if you define "Best Team Ever" as "Most Championships" you lose. I have only watched a few Colts games so this is new to me. When Peyton gets to the line he is yelling out signals. Sometimes the announcers say he is audibling to a different play. But I have noticed that other quarterbacks are starting to call audibles. Is this an example of teams copying Peyton and the Colts offense and trying to do what they do? The Super Bowls has everything to do with your assertion that no one can copy Peyton. Why copy Peyton if it doesn't win championships? Cowboys beat the colts either last yr or the year before 21-14. ?? they take pictures of the def alignment and what the db's did on that play . they look how the play went and who was open and who was not and what the tendencies were on that play as well as on other plays. then they tweak the play a little and use that info all during the game. It is not rocket science.It is all about fooling the other team and tweaking plays. The thing that sets manning apart from most guys is the fact that he is a real student of the game and learns correctly and applies it. Most players just aren't willing to do that to the degree that manning does.I don't think anyone studies it as much as he does. Only other thing I've seen work against Manning was something the Bears did in the opening week of the '08 season. They brought an entirely new scheme to the table, placing six or seven guys up on the line of scrimmage with some blitzing and some not. It wasn't anything they'd ever done before, and I felt like it was something they'd taken an entire offseason to put together. Maybe that's how you slow down Peyton: create a defense he's never seen before. Thanks for the support. Sometimes the sports radio crowd comes here; thus the craziness. Thanks, I appreciate it. Come again. Probably the best breakdown of Peyton I've ever read. What I love most about #18 is his mental aspect. I saw flashes of it at Tennessee but he took it to another level in the NFL. We will not see his like again. Thanks for this great article! !